Mister Guido Minisky, DJ, artistic director at the Chez Moune Club (Paris), responsible for the great Kid Creole compilation Going Places - The August Darnell Years 1974-1982 & most importantly ACID ARAB frontman, probably gave a better name to this musical movement - calling it ACID ARAB: ''The idea is to give a name to this musical movement, and to present ourselves not as "know-it-all geeks" but as 2 djs playing house & oriental music...'' For more info please visit & join ACID ARAB on facebook here and here. Lots of info & music shared there, tune recommendations via youtube, mixes & more... And its growing! Finally the ''Acid Arab Genie Is Out of the Bottle'' - sharing all those magic! 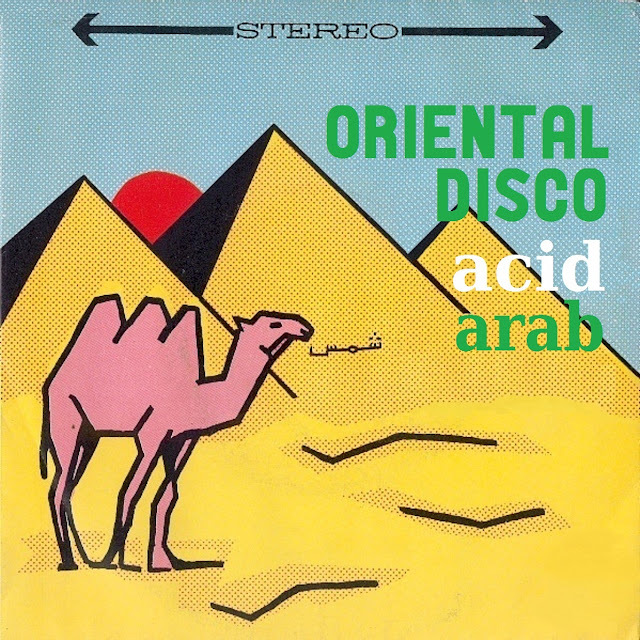 Also check out the Acid Arab soundcloud page. Sounds a bit factory-made Orientunes to my eastern ears with all the DJ mixes and what-not, but I am posit it will racket in the westerners' ears and cause a stir enough to set their stapled-to-the-floor asses to dance. I thought this compilation was freeking awesome, I dunno what some of the comments are all about but it's perfect. Your site is the Shizznitt !!! Hi there, link is dead, can you do something ? ...check my comment from "August 19, 2014" above!